If there is any material that separates the wheat from the chaff, the heavy-duty from the entry-level, it’s denim. If a sewing machine can deal with denim with ease, you already have upgraded your standards considerably. Denim and jeans are almost interchangeable but what is denim exactly? It turns out, it’s a mere cotton, but weaved in such a pattern as to form an extremely sturdy fabric, suitable for all kinds of hands-on work. The name ‘denim’ was derived from a particularly robust fabric in the French town Nimes, de Nimes, so we ended up with ‘denim’. Initially, garments made from denim fabric were targeted to workers, as durable and cheap clothing, but now you can find denim jeans as expensive as a classy business suit. Although more durable than most clothing, it still can be damaged or ripped. This is where a good sewing machine comes into play. Whether you want to patch denim jackets or jeans, making them as good as new, or if you want to create completely new designs, you will want to choose carefully which sewing machine to pick for the job. In this buying guide and in the in-depth reviews, we sift through six models in order to find the one that is most suitable sewing machine for heavy fabrics. Japanese companies are lauded for their striving to deliver reliable products that just work, and Janome is no exception. You will find Janome sewing machines to be on the upper end of price, but they are almost always well worth it. It is exceptionally sturdy, stable, precise, and most importantly of all – easy to use thanks to its powerful motor. It is highly unlikely that you will encounter any jams. Furthermore, it makes working with it a pleasure since its noise output is well-muffled. Its full computerization means that you get to enjoy precision and convenience in equal measure: automatic needle threading, automatic tension control, automatic buttonhole sewing, and automatic thread cutting. All of this is controlled via the intuitive and large backlit LCD display, while the right side is entirely covered with 50 stitch diagrams. These symbols have been standardized, so if you already have any experience working with sewing machines, you will be familiar with what kind of symbol denotes what kind of use scenario. However, the most prominent feature of this heavy-duty sewing machine is its emphasis on auto-precision. With the automatic tension control, the needle position is ever adjusted in micro-increments no matter the type of the fabric you are working with. You will always be able to perform top-notch stitching. Via the LCD screen you will be able to cycle through the whole range of 50 stiches, while also adjusting the width and length of stitching. The flexible foot presser is another feature worth of note. It will be a great help in preventing the fabric from stretching and puckering, in conjunction with the removable free arm. 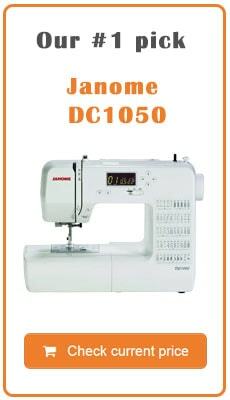 Overall, Janome DC1050 is a highly precise, smooth-operating sewing workhorse capable of completing any sewing work you challenge yourself with: embroidery, quilting, decorations, alterations, and garment crafting. It’s well worth the price considering Janome’s excellent reputation and a 25-year limited warranty. Also Japanese, but this time all-black, Super Jeans J34 tells you everything you need to know right in its naming scheme. The special feature of this sewing machine for heavy fabrics that makes it stand out and ‘super’ is its ability to sew through multiple layers of denim! In fact, you can subject it to 3 – 12 layers of denim. In particular, 12 layers of soft denim, and 9 layers of hard denim. Can you just imagine the combos you will be able to make? Of course, that doesn’t mean you need to restrict yourself to just denim layer. You can do equally well with neoprene layers too. 34 in-built stitches, of which you can choose: blind hem, decorative, utility, overlock, stretch, applique, triple reinforced zigzag, 4-way smocking, and a 4-step buttonhole. Several guides and instruction manual covering specific sewing work, very helpful! Unfortunately, as you might have noticed from the 4-step buttonhole and a lack of LCD screen (dial instead), it is not a fully computerized sewing machine, but it does have an automatic needle threader which every sewer much appreciates as it alleviates eye strain and frustration. Also, one of the misfortunes of a non-computerized sewing machine is that you have to think about the little things. For example, there is no automatic needle up, so you need to bring it up manually every time you stop the machine. Not too much of a hassle, and it can become ‘automatic’ once you establish the working relationship with the machine. With the top dial you can change the stitch length for the first 15 stitch patterns, between 0 – 4mm. Lastly, the lighting is surprisingly last-gen as it has a hot, incandescent light bulb instead of the much more comfortable and cooler LED lighting. Of course, you can always opt to change it. To conclude, its special multi-layer feature not constrained to denim, makes it well worth considering. 110 built-in stitches; decorative, quilting, and everything in between. Brother XR9500PRW didn’t get the enviable ‘Amazon’s Choice’ label for no reason. In conjunction with the price and its epic stitch range and full computerization, it is a must-buy for beginners. The included DVD is especially useful if you are just starting out. Yes, it is technically for advanced users as well, but the automatic features make it a very smooth sewing experience across the board. Additionally, it is indeed an outstanding heavy duty sewing machine for hemming jeans, linings, straps, bags, and everything else you can think of. Among the automation features that make your sewing flow easy-going, are the automatic bobbin wind and the precise electronic speed control that befits a sewing machine that is fully computerized. It truly is amazing how they managed to pull off such a complete package for such a moderate price tag. ‘Amazon’s Choice’ well deserved indeed! Non-computerized but largely automatic: needle threading, 1-step buttonhole, tension control via pressure foot, bobbin wind clutch. Beside the impressive maximum sewing speed, the heavy duty moniker also extends to its formidable stainless steel build, both for frame and bedplate. However, the total weight doesn’t exceed 14.5 lbs, so it is still a moderately compact machine. The above average speed indicates that it is indeed an industrial denim sewing machine, despite lacking in the stitch range and not having an automatic thread cutter. You can switch to free motion sewing facilitated by the drop feed, giving you enough leeway for top-notch top-stitching. Despite the low price, you won’t encounter any disruptions like skipping, jamming or jerking. The internal heavy duty steel frame, as well as the steel bedplate, make sure of that. Overall, you get a very smooth sewing experience. Most importantly, it is capable of sewing through multi-layered fabrics done via the extra-high pressure foot. And the included free arm will help with the tight holes like sleeves and collars. Although it doesn’t have all the bells and whistles that you would expect from Brother or Janome, this is one powerful, cheap sewing machine. That combo alone makes it irresistible! When you find yourself with an expensive machine like Janome HD3000, one that offers merely 18 stitching types, you know that you have entered a heavy duty, specialized territory. Yes, for 3 times less the cost you will find sewing machines that have 100 stitches and are fully computerized. However, you should ask yourself if it is capable to perform heavy work. All the stitch types in the world will become useless, if it is not powerful enough for a simple jeans patching job. Automatic push-pull bobbin winding, saves you a lot of time in addition to being jam-proof. Automatic needle threading and automatic 1-step buttonhole sewing, 1 style. Foot pressure control, for when you are sewing multiple layers of tough, thick denim fabric. Reverse lever, for backing up the stitching. In fact, the only thing that separates it from a fully computerized machine is the omission of automatic tension control. On the other hand, if you are an experienced sewer, your need for it would be significantly lessened. With that price, it would be a mistake to not include proper accessories, so you will be glad that Janome didn’t make it as it comes with an extension table perfect for big sewing projects. As for its build quality, it’s simply outstanding. The all-white color may be misleading you to think it’s plasticky, but fear not; it’s all-aluminum. Furthermore, with all that power and staunch build, it runs exceptionally smooth. No frustrating noise to speak of, which is quite an accomplishment. In short, Janome HD3000 is a testament to the fact that just looking at a list of features can be extremely misleading, as once you experience it in action, you wonder how could you have even doubted its sewing prowess. An astonishing 600 built-in stitches, and you thought that 100 was already overwhelming! Large LCD screen for viewing stitches, length and width adjustment, errors, and a Digital Information Advisor, which can be very useful if you explore it to its full potential. As you can surmise, Stylist 9960 is designed for the pickiest and experienced sewers who want to have a huge array of options, suitable to complete any project with outmost precision and efficiency. For example, you can either use the electronic auto pilot or you may want to use the foot control for the same function. It will take you awhile to customize it just the way you like it, but that brings even more excitement! Of course, all of this can be overwhelming for beginners, but at the same time you will find it exceedingly easy to use if you know exactly what you want. Furthermore, its full computerization features means that you will always produce professional-level work, at least at a technical level – perfectly straight stitches every single time! As for its capacity to deal with heavy fabrics, you will have no trouble stitching through thick leather or denim, but multiple layers may be another matter. If that will be your common use scenario, you may find the Toyota Super Jeans J34 to be a better option. 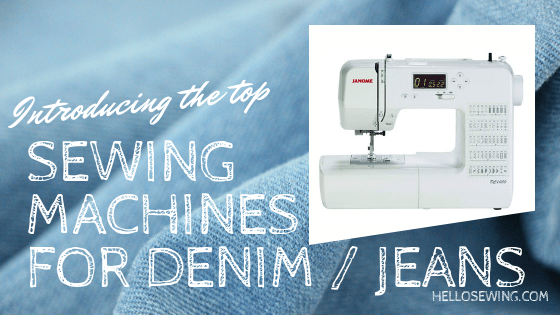 Getting the right sewing machine that enables you to easily work with denim is just one part of the equation. You will also need to use proper needles and threads for denim in order to puncture through such thickly-weaved cotton fabric. Fortunately, you will find such needles properly labeled as either jeans or denim needles. However, you should still make a difference between the light and heavy denim. For the former, use smaller 90/14 needles, and for the latter, use bigger 100/16 – 100/18 needles. As for the threads for denim, use thread that is heavier for topstitching seams (which are necessary to reinforce seams for such heavyweight fabric), and the regular one for other seams. Additionally, if the denim is really thick, adjust your sewing length to 3mm. Make denim more malleable for topstitching by exposing it to heat. Use your iron at its highest setting and exert plenty of pressure to get it ready. Don’t forget about peppering your denim design with plenty of support in the form of metal zippers, rivets, and heavy duty snaps. After all, that’s what makes denim clothing so sturdy in addition to the fabric itself. Pick the right denim for the job; heavy denim for pants and jackets, and lighter, thinner one for shirts, skirts, and other more comfortable clothing. Keep a lookout on grainlines so that you have properly aligned stitching, either crosswise or lengthwise. In addition to using metallic closures, sturdiness of denim clothing is greatly helped by the finishing seam; Hong Kong, flat-felled, mock flat-felled. Depending on the alignment you should combine them as well. Hone in on what you want to accomplish and you will come to the right answer. Will you work with multiple layers of thick fabrics? Do you want to work with thick fabric but don’t want to compromise on all the other bells and whistles for all other kind of work? Do you want a very cheap sewing machine that does an excellent job at denim and leather work, but doesn’t offer many features of convenience and versatility? Each of the answers to those questions is covered by one of the sewing machines listed here. All you have to do is commit to the decision, but no matter what you end up deciding, all of them are already in an elite league of sewing machines.